This lovely has been named Clarabelle. It is a small bonnet style hat or fascinator that would add that finishing touch to any steampunk or Victorian inspired outfit. 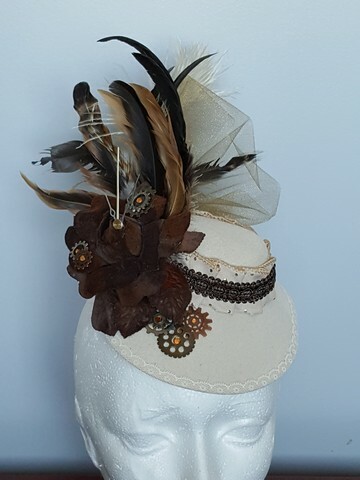 The base is a cream coloured felt like material and the hat form has been accented with a vintage velvet flower with leaves, ribbon, braid, tulle, feathers, gears, watch hands and amber hued flat back crystals. The bonnet attaches to ones hair with two sturdy and secure clips on the underside of the hat’s brim.